The Gimbal SDK V3 adds support for Android 8.0 Oreo and simplifies integration of the SDK into your app. This guide provides examples of the available functions in our SDK along with a step by step guide on how to create a Gimbal SDK enabled application. If your app currently uses Gimbal SDK V2, you will need to migrate to V3 in order for it to operate properly on Android 8.0 devices. Please refer to our V2 to V3 Migration Guide for details. Go to the Gimbal Manager and sign up to create a new account. The following steps will guide you through setting up a new application. As part of the Gimbal SDK download, we include a sample app which demonstrates all the basic SDK features such as place and communication events. 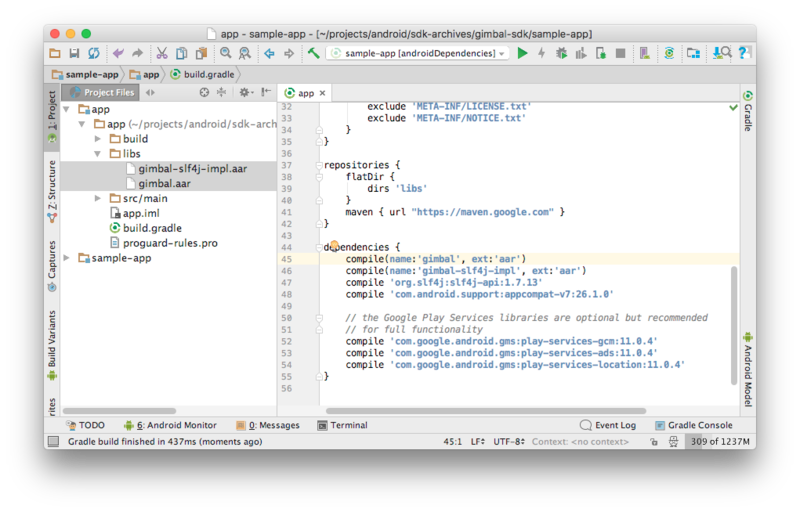 While we prefer Gimbal to be intergrated into an application built in Android Studio, our SDK can still be used with applications built in Eclipse. Included in this guide are instructions for getting Gimbal up and running in your app for both development tools. 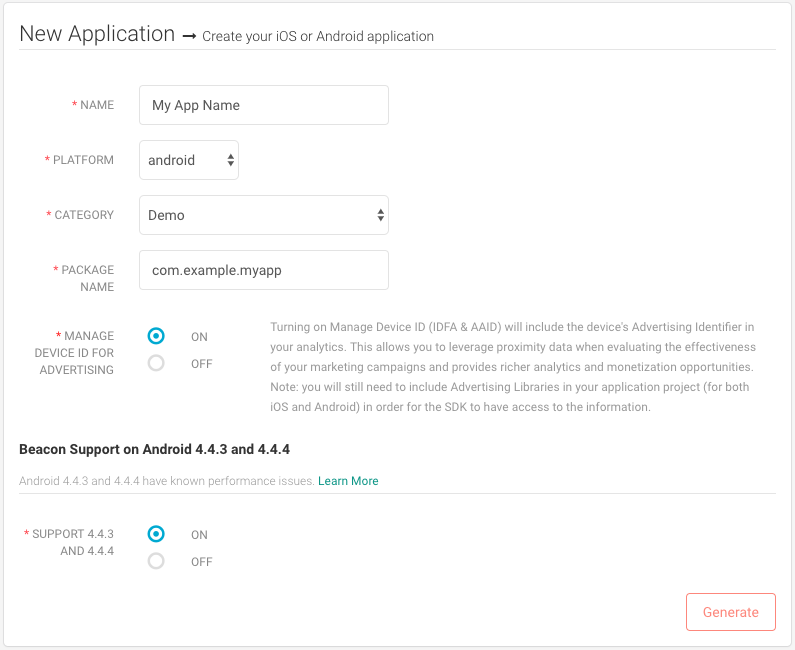 The Quickstart provides a link for a sample application built with Android Studio and automatically creates the necessary Gimbal Application for Android. Have a device with Android 4.4.3 or higher if using proximity(beacon) features. Important Proximity is not enabled on Android 4.4.x devices by default. You can enabled this on a per application basis in Gimbal Manager. 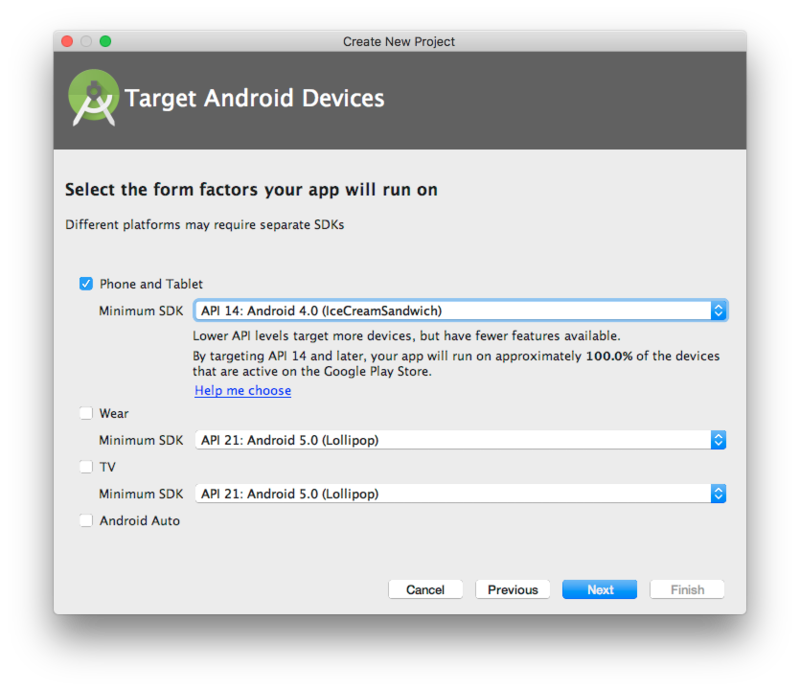 In Android Studio under Quickstart choose "Start a new Android Studio Project"
Fill out your "Application Name", "Company Domain", and "Project location" fields. Important The "Minimum SDK" should be set to at least API 14. Finish up by adding and customizing the appropriate activity for your app and press "Finish". Dependencies may be added to your project via artifacts from the Maven Central repository, or with the AARs packaged within our published Gimbal SDK zip file. Version 3.0 is the current SDK V3 version as of this writing. As updates are made, they will be made available in the SDK Downloads section of Gimbal Manager. Add the AARs to your Android application by copying them into the libs folder of your app module. After adding them, add the following lines to your app's build.gradle file. Note Note: Play Services version 11.0.x is the minimum version for full Gimbal SDK functionality. It is also the latest version that supports targeting Android API 25 and lower. If your application targets API 26, you may safely use later versions of the Play Services APIs. The Gimbal SDK uses SLF4J as a logging adapter to the underlying Android logging API. The gimbal-slf4j-impl library is a pluggable implementation of the API. You may replace our SLF4J implementation, but you must retain the slf4j-api dependency. Note When sourced from a Maven repository, the gimbal-slf4j-impl POM references slf4j-api:1.7.13 as a compile dependency. When sourced from a local directory, there is no external dependency information, so you will need to include slf4j-api as a compile dependency in your app. The Gimbal SDK must be initialized from within your Application.onCreate() method. Apps created within Android Studio do not start with a Application derived class, so you must add your own derived class. The class must also be added in your app manifest in the android:name="..." attribute of the application element. The Sample App included with the Gimbal SDK includes a SampleApplication class that you can use for reference. The included manifest shows how to specify SampleApplication so that Gimbal gets initialized properly whenever the app starts. When integrated correctly, the Gimbal SDK will generate Place Events and Communications even when the user isn't using the app. Calling Gimbal.setApiKey() links instances of the application with a specific application that you have created in Gimbal Manager. This must be invoked before any other Gimbal calls, from within your application's onCreate() call hierarchy. In the Sample App, this is called within GimbalIntegration.onCreate(), which is called from SampleApplication.onCreate(). See the Set API Key and Add Application sections below for more details about the call and how to get an API key. Listeners allow the app to be notified of location events and Gimbal Communications configured on Gimbal Manager. The Gimbal SDK has three listener interfaces for Communications, Place events, and Beacon events. The example below shows the addition of a Communication listener. Important The Gimbal SDK only holds weak references to your listeners. You must hold your own references so that the listeners are not made eligble for garbage collection. Note If no listeners are added, end users will still receive default Notifications in the system tray upon receipt of Gimbal Communications. The most direct way to start monitoring for Gimbal events is to invoke Gimbal.start(). This starts the PlaceManager, CommunicationManager and EstablishedLocationsManager. These services may alternatively be started individually for special use cases. Please refer to our Runtime Permissions for Marshmallow section and to our Sample App for additional information and code samples. Create Your Gimbal Application in the Gimbal Manager. You will be presented with a form where you will enter the following information: Name of your app, Platform (android), App category, Package name. Enter the package name you set in your Eclipse New Application. You will also need to select option for Android 4.4.3 and 4.4.4 (Kitkat support). Important If you are testing with an Android device with version 4.4.3 or 4.4.4, you must allow for Kitkat support when using proximity features. Hit the Generate button. Once finished, your app will have a Gimbal API Key. Important You will need to set the API Key in your Android app. You will be presented with a form where you will enter information about your Place. A Place represents both Geofence and Proximity. For example, a place can be represented by a geofence (circular or polygonal) or a series of beacons. Please enter your Place information. For example, you can enter a Place name and enter your activated beacon(s). You can always update your Place by adding a Geofence or add/delete your beacons. Note This is where you would enter the Place(s) where you will look for Place Events in your app. You will be presented with a form where you will enter information about your communication. For example a Communication can be entered for a place and when an app enters the specified place, a notification will be received. Please select 'Save & Publish' to activate your communication. There are a number of application settings that you can configure. These can can be found by clicking on the Application’s Bundle ID / Package Name within Gimbal Manager. The following settings control how place events are triggered. Note: any of the similar settings you set for a Place take precedence over these app-wide settings. The 'Arrival RSSI' setting allows you to specify a specific RSSI (signal strength) to be used in determining if a beacon sighting should be processed as an arrival to a beacon. Signals weaker than 'Arrival RSSI' will be ignored. Default = null, such that whenever a beacon is first detected it will cause a sighting and an arrival. You may wish to modify this value if you wish to decrease the range of when a beacon trigger an arrival. The 'Departure RSSI' setting allows you to specify a specific RSSI (signal strength) to be used in determining if a beacon sighting should be processed as a departure. Signals weaker than 'Departure RSSI' will be ignored. Note that the Departure RSSI must be at least 10dBm lower than the 'Arrival RSSI'. This is done to avoid excessive bouncing (where arrival and departures events are triggered repeatedly, even when both the mobile device and beacon are standing still). The ‘Departure interval’ is the number of seconds that must elapse where the SDK does not see a beacon RSSI level stronger than the Departure RSSI before processing the departure. The smoothing algorithm processes RSSI signal strengths from sightings to make them less jumpy. The larger the smoothing window the more steady the output RSSI readings will be. These settings allow you to turn specific features on/off. Allows you to turn on/off geofencing monitoring. This may be desired if your application only uses beacon-based places. Allows you to turn off beacon monitoring. This will affect both beacon-based Place detection and beacon detection. 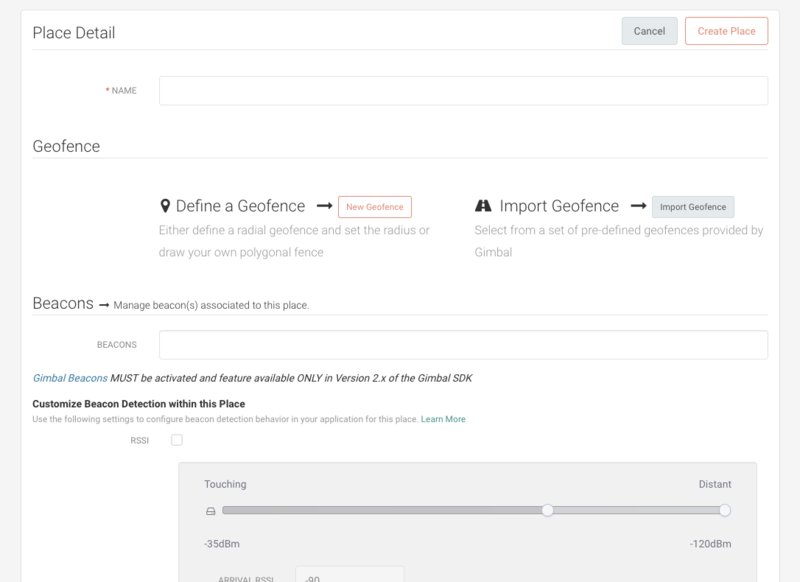 This may be useful if your application only uses geofence-based places. Allows you to turn on/off Communicate delivery. This may be useful if your application does not use the Communicate feature. Allows you to turn on/off whether Gimbal records the device advertising identifier and limit ad tracking state for devices. Turning this on is necessary if you wish to correlate your advertising data with the data collected by the Gimbal SDK. This functionality is off by default. Your application must include the Google Play Services to use this feature. Note For privacy reasons, when a device's advertising identifier is reset, the device is re-registered with Gimbal and receives a new application instance identifier. The configuration for communication limit frequency can be found in the 'Communicate' tab then the 'Triggers' section in Gimbal Manager. The following settings are used to limit frequency when triggering communications for place events. Selecting 'Yes' in the 'Limit Frequency' drop-down displays additional options for setting the frequency interval. The 'Only Deliver Once Every' setting allows you to specify the value in hours, days or weeks for the communication frequency. Please note, one day specifies a 24hr period. One week specifies a 168hr period. For example, if the frequency limit is set for one day, then a user who initially receives a communication at 4pm won't get that same communication until after that 24hr period, no matter how often the user comes back in and out of the triggering place. Important If your CommunicationListener implements presentNotificationForCommunications, you MUST handle frequency limit and delay (dwell) yourself. The configuration for communication delay can be found in the 'Communicate' tab under the 'Triggers' section in Gimbal Manager. Setting delay on a communication allows the communication to be delivered with some delay after a person has entered or exited a place. If a communication is scheduled to be delivered with some delay after a person has entered a place and the person exits that place before the communication is delivered, then the communication will be canceled. Similarly, if a communication is scheduled to be delivered some time after a person leaves a place and that person re-enters the place, the communication will be canceled. Keep in mind that if delay causes a communication to be scheduled after the expiry date of the communication, it will not be delivered. Important If your CommunicationListener implements presentNotificationForCommunications, frequency limit and delay (dwell) are honored only for communications returned by that method to the Gimbal SDK. Only use presentNotificationForCommunications if you want to handle scheduling and delivery of communications yourself. 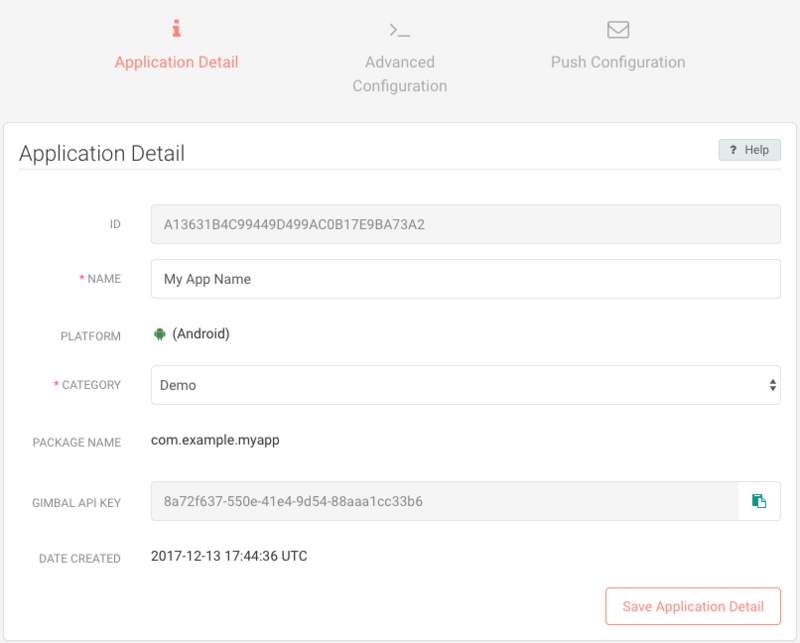 Gimbal allows you to send instant (push) communications using Google/Firebase Cloud Messaging (GCM/FCM). 1. In the Firebase console, click Add project. 2. Supply a project name and click Create Project. 3. Select the gear icon next to your project name at top left, and select Project settings. 4. Select the Cloud Messaging tab. You can find your sender ID and server key in this page. The sender ID is the GCM Sender ID. 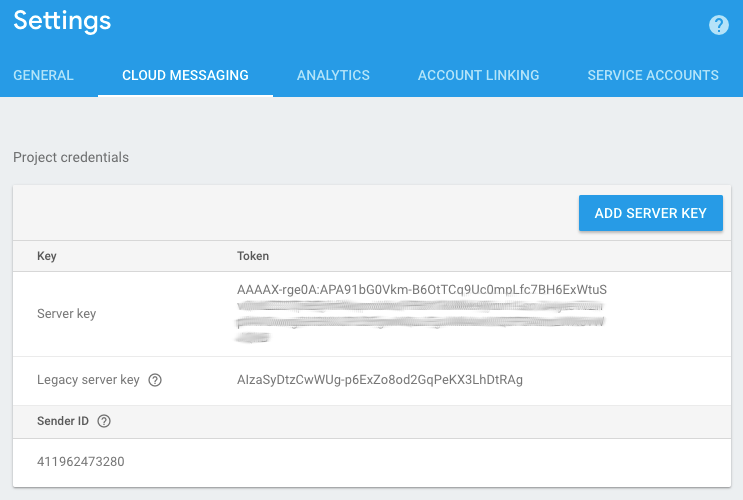 The server key is the Cloud Messaging Key you will enter in your Gimbal application. Note Before moving forward make sure that you have obtained the Server key and Sender ID from Firebase Console. On Gimbal Manager, select your existing Android application and scroll down to the Google/Firebase Cloud Messaging Key section to setup Android push. 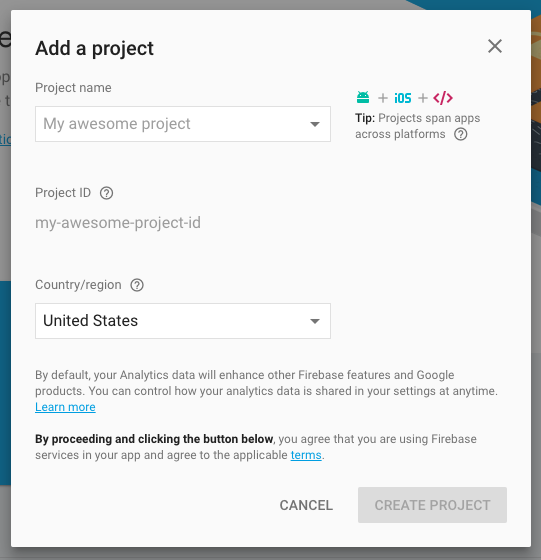 Enter the Server API Key (created from Firebase Console) and hit save. Now your application is set to send push messages. In your application, add the Sender ID to the registerForPush method. For details on how to register your app to receive push messages, look at section Register For Push. There are two ways to register with GCM/FCM to send messages to your app. 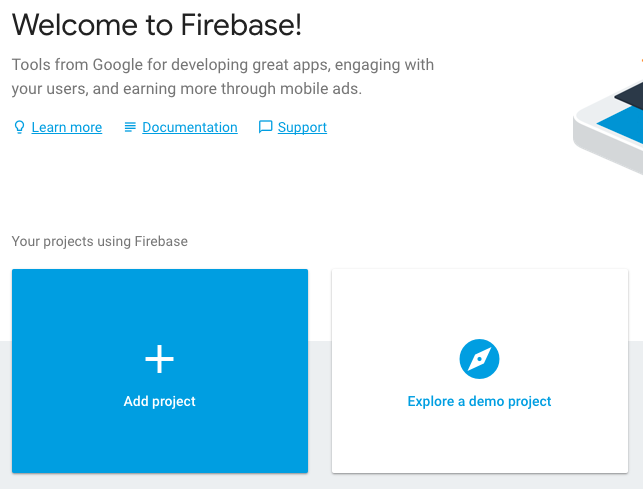 The first method is by using the Sender ID (generated from creating the Firebase project) to register for Push. The second method is by using the Registration Token (obtained from calling the GoogleCloudMessaging register method) to register for Push. Note If both methods are used within the same application, only the last method is used to register for Push. Whenever a push is sent to the client, Gimbal will call the CommunicationListener methodshouldPresentNotificationForCommunications. Your application can now decide whether or not to raise a notification to the User or allow the Gimbal SDK to raise the notification on your behalf. // on behalf of the developer before applying frequency limit and delay. Instant Pushes are pushes that are sent immediately. To send instant pushes, go to the Communicate tab on Gimbal Manager, and click on + New. On the resulting Communication Detail page, fill in an identifying name for your Communication. Select "TIME TRIGGERED: NOW (INSTANT)" in the Triggering Event dropdown box. The Start Date and End Date entries will disappear. Fill in the details of your push message and click on Save & Publish to send your Instant Communication to your device. Time Triggered Push Notifications are Push Notifications that are sent at a specified time. To send instant pushes, go to the Communicate tab on Gimbal Manager, and click on + New. On the resulting Communication Detail page, fill in an identifying name for your Communication. 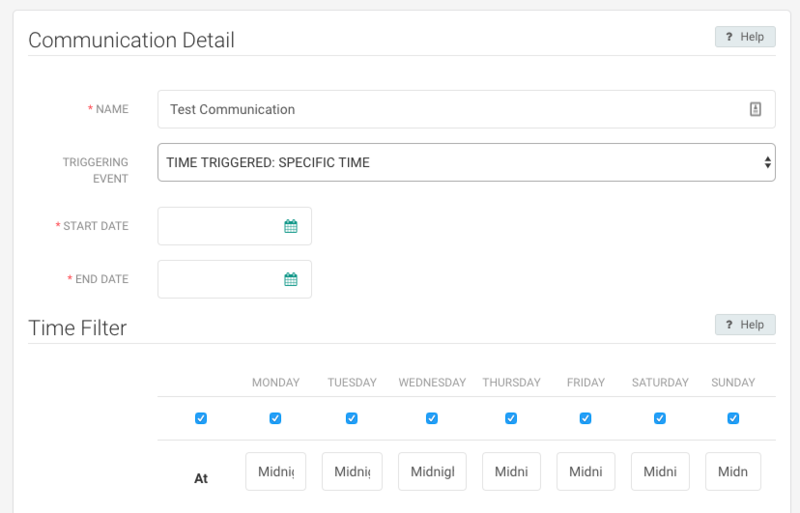 Select "TIME TRIGGERED: SPECIFIC TIME" in the Triggering Event dropdown box. Enter a start and end date, and any time filters as needed. This call sets the API key for your Gimbal application. When you register an application on the Developer Portal the API key is generated and supplied to you. This was done in the previous section Create Gimbal Application. Important Gimbal.setApiKey must be invoked from your Application class's onCreate() method. In the Sample App, this is done within the GimbalIntegration class, which is invoked from SampleApplication.onCreate(). If using GimbalIntegration as a template, simply paste your API key into the value of its GIMBAL_APP_API_KEY variable. The Gimbal defines the interface for starting all the services like PlaceManager, CommunicationManager and EstablishedLocationsManager, stopping the services and finding the status. Starts all the Gimbal services which includes the generation of events based on the users location and proximity to geofences and beacons, receive communications associated to place entry and exit events and generation of established locations based on the users locations. Its a method for starting the PlaceManager, CommunicationManager and EstablishedLocationsManager. These features can also be controlled server side anytime for a specific application using advanced configuration at Gimbal Manager. Stops all the Gimbal services. Its a method for stoping the PlaceManager, CommunicationManager and EstablishedLocationsManager. The PlaceManager defines the interface for delivering place entry and exits events to your Gimbal SDK enabled application. You use this class to start or stop place monitoring and to check whether monitoring is enabled. Starts the generation of events based on the users location and proximity to geofences and beacons. Important Please check the following section if you are targetting android SDK 23 and above for runtime permissions checks. Stops the generation of events based on the users location and proximity to geofences and beacons. The following gets visits for places that you are currently AT. The array returned is ordered ascending by arrival date. This is the listener for place event notifications. One of the following methods will be invoked based on the place event. // will invoke the method immediately upon entry. // This will be invoked when a beacon assigned to a place within a current visit is sighted. // This will be invoked when Gimbal has detected a reliable location. The Vist class defines the period of time which a User dwelled at a place. A Visit without a departure time represents an active visit where the User is still dwelling at a place. The Place class defines a place which is represented by a geofence (circular or polygonal) or a series of beacons. A place is defined in the Gimbal Manager portal. The Place class defines a BeaconSighting which is represented by a sighting information of a beacon. Create and implement the PlaceEventListener interface. Add the PlaceEventListener to the PlaceManager instance. Note PlaceEventListener methods are implemented by default. To customize, please provide your own implementation for the desired PlaceEventListener methods. The CommunicationManager defines the interface for delivering communications to your Gimbal SDK enabled application. You use this class to start or stop receiving communications. Enables the SDK to receive communications. Stops all communication delivery. This includes both local and instant(push) communications. Sets the Android Notification Channel ID to be used for Notifications posted from Gimbal Communications for clients running on Android 8.0 and newer, for apps targeting API 26 and newer. 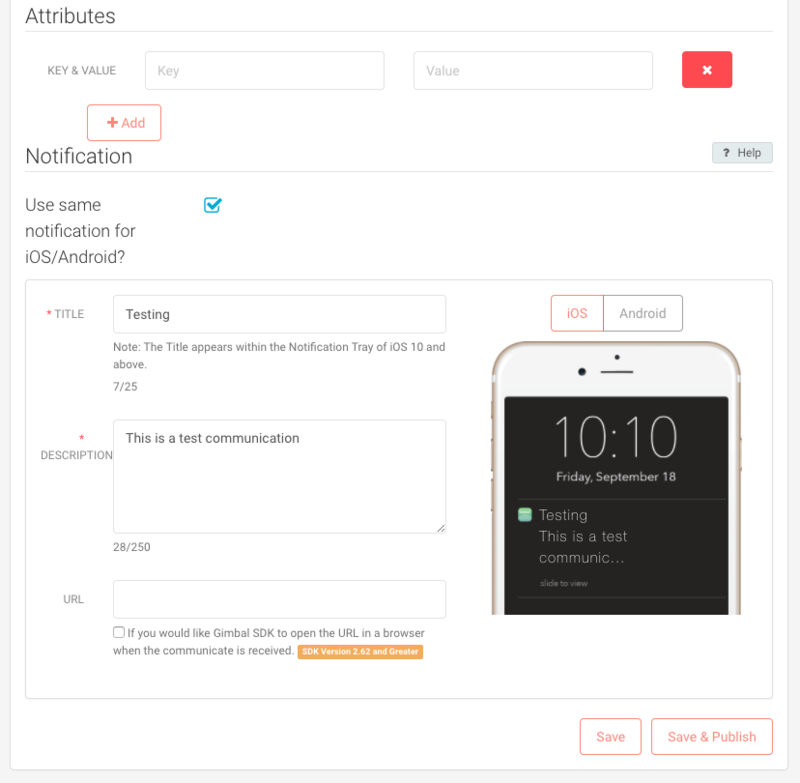 By default, the Gimbal SDK will create and manage its own channel for notifications to be posted to. If any custom behavior is desired, e.g. vibration patterns or sounds, the developer may create and manage their own channel and specify it with setNotificationChannelId. Note If a CommunicationListener is added that returns a Notification.Builder from its prepareCommunicationForDisplay() methods, then setNotificationChannelId has no effect. Note Once set, the channel ID remains in use until null is specified. Declining to call setNotificationChannelId() does not clear a previously set ID within an application instance. This is the listener for communications. One of the following methods will be invoked based on the communication event. Important Gimbal does not support posting Notifications for versions below 3.0 for Visits & Instant Communications. Developers must override one or more of the following methods in CommunicationListener and post notifications. // on behalf of the developer after applying any frequency limit and delay. // If you implement this method to filter communications, you MUST handle frequency limiting and delay yourself. //notification visible to the end user and the rest were collapsed. // from this method. The SDK will use a default implementation if null is returned. // later device when your app targets API 26. A Communication is defined in the Gimbal Manager portal. Note CommunicationListener interface and methods are implemented by default. To customize (ie: by receving event callbacks), please provide your own implementation for the desired communication listener methods. The BeaconManager defines the interface for delivering beacon sightings to your Gimbal SDK enabled application. You use this class to start or stop listening for beacon sightings. Allows the BeaconManager to start listening for beacon sightings. Note PlaceManager and BeaconManager works independently of each other. For example, to just get place events, you'll need to start monitoring on PlaceManager only. Stops beacon listening. No beacons will be sighted. This is the listener for beacon sightings. The following method will be invoked upon beacon sighting. A Beacon is activated in the Gimbal Manager portal. getUuid() returns the 32-character UUID for this beacon as type String. This value corresponds to the beacon ID returned by the Gimbal Manager. getTemperature() returns the temperature of the beacon in Farenheit as type Integer. The value will be Integer.MAX_VALUE if no temperature sensor is present on this beacon. The EstablishedLocations Manager defines the interface for enabling the Established Locations feature in the Gimbal SDK. Once enabled, Gimbal will passively monitor for locations commonly visited by the user. Each location inferred in this way is scored by a relevance value. Check if established locations has been enabled. Enables the passive collection of Established Locations. Disables the passive collection of Established Locations. Retrieve the Established Locations inferred by the Gimbal SDK for the user. Each Established Location contains a boundary represented by a geographical Circle (with a center latitude/longitude and radius in meters). In addition, each location is accompanied by a score representing the relevance of the location to the user. A higher score value dictates higher relevancy. The EstablishedLocation class defines a commonly visited location of the user. It contains a relevancy score and a boundary defining the geographical features. The Coordinate class represents a latitude and longitude. Requires SDK 2.63+ The Device Attribute Manager allows you to associate attributes specific to the user of that individual device. Attributes can be set by passing in a map to setDeviceAttributes:. The passed in map will replace existing attributes. Passing in null or an empty map will remove the attributes associated with specific device. The current attributes for a device can be retrieved through getDeviceAttributes. Important Only use this API if you intend to reset the Application Instance Identifier for this SDK instance. Normally this is not required. This call dissociate a device and data (place events) reported by the application running on that device. The open place sightings gets closed on server. Data on device also gets cleared due to this API invocation. Runtime permissions are a new feature in Android 6.0 Marshmallow that allows you to request permissions at runtime, when it matters rather than at install time. Your application which uses Gimbal SDK need to integrate runtime permissions in order to avoid any unexpected behaviour or crash. Gimbal SDK is not responsible for requesting permissions runtime. Learn more about Requesting Permissions at Run Time. Important Applications using the Gimbal SDK must implement the runtime permissions checks in their application if their targetSdkVersion is 23 or above. The Gimbal SDK will not request runtime permissions. Note Gimbal uses the android.permission.ACCESS_FINE_LOCATION "dangerous" permission for location services and sighting beacons. This permission is merged by default into your application's manifest from the SDK AAR manifest. If location services are not required for your use of the Gimbal SDK, it is possible to operate with just beacon sighting with the android.permission.ACCESS_COARSE_LOCATION "dangerous" permission. The runtime permissions checks need to be made before making the startMonitoring call in PlaceManager. 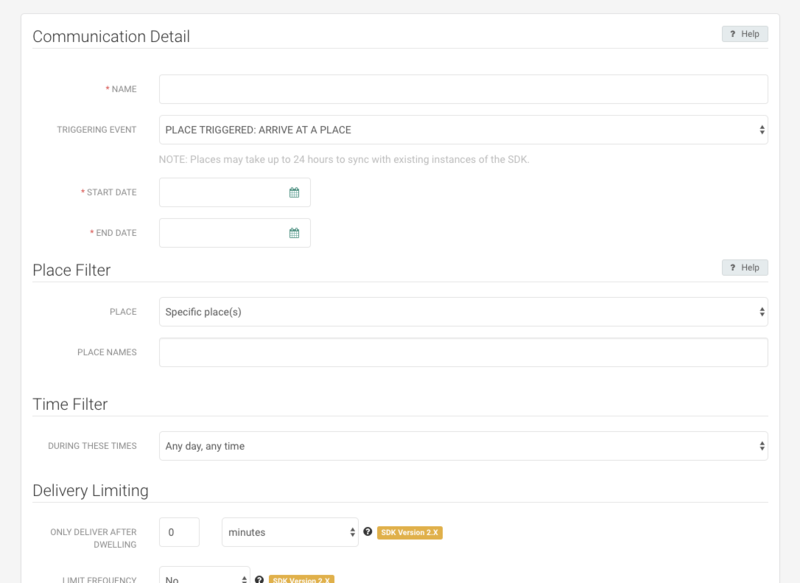 The PlaceManager defines the interface for delivering place entry and exits events to your Gimbal SDK enabled application and uses the location access. Depending on where you are calling the Gimbal SDK api's specifically the above mentioned(place monitoring and beacon monitoring) you will have to add some extra code in your Activity to handle the runtime permissions. The Sample application which is packaged with the SDK has a helper class which shows you how to handle it, but here's some details on what apis are available and how to achieve it. Make sure you use the above api to check the permissions are granted to you. If the permissions are already granted then you need not check anything else and go ahead and use the gimbal apis. If the permissions is not granted , you will have to go ahead and request it as below. This is an asynchronous call and make sure the Activity is handling the onRequestPermissionsResult callback. If you want to give a rationale or explaination to the users about why you need these runtime permissions you could use another api to leverage it. We have to make sure the user is convinced that we need runtime permissions for Gimbal SDK to function correctly. This method returns true if the app has requested this permissions previously and the user denied the request. Show an explanation to the user asynchronously. Don't block this thread waiting for the user's response. After the user sees the explanation, try again to request the permissions. What will happen if permissions is revoked while application is in background? Permissions can be revoked anytime through the phone's "Settings" application. When the Manifest.permission.ACCESS_FINE_LOCATION permission is revoked, PlaceManager will not be able to generate any place events in foreground or in the background. Whereas the BeaconManager will be able to generate events only when the application is in the foreground. Applications using Gimbal SDK should check for Manifest.permission.ACCESS_FINE_LOCATION permission when the application comes in the foreground and request for the permission to be granted and handle gracefully if the permissions are denied. Please follow "Permissions Best Practices" guide provided by Google here for more information. Enables beacon sighting logs. These logs gives more information about beacon sightings your application is currently seeing. Use 'SIGHTINGS' keyword as a filter in your LOGCAT to see the relevant logs. The driving change behind the version 3 release is support for Android 8.0 Oreo. In addition to structural changes required by Android 8.0, we added support for custom Notification Channels and greatly reduced the amount of setup required for new apps. Existing apps need to make a few changes to how the Gimbal SDK gets initialized. In addition to changing our artifacts' versions, we changed the Group ID to signal that this change will a bit of additional work from developers. Previous versions of the Gimbal SDK worked best when invoked from a background service, but this approach is no longer viable in Android 8.0. Now the best way to get Gimbal started is from within your Application's onCreate() method. The Gimbal Sample App (bundled within the SDK zip downloadable from Gimbal Manager) has an example of how this can be done. Instead of initializing Gimbal from within your service's onCreate(), the same initialization code is moved within the GimbalIntegration class. This is then initialized and invoked from the application's onCreate(). Similar to what we did with the manifest, we also automatically merge in the ProGuard rules required to keep our stuff working if/when you optimize and obfuscate your APK. Android 8.0 adds a Notification Channel feature to grant end users finer control over the notifications that are presented to them by apps. Each Notification on an 8.0 device in an app targeting API 26 or newer must be assigned to a channel or it will not post to the user. The developer returns a Notification.Builder from prepareCommunicationForDisplay in a CommunicationListener. Important If your app already does this, a channel ID must now be set in the Builder, and the developer is responsible for creating and managing that channel. The Gimbal SDK will not create a channel for use with developers' Builders. Else if a Builder is not returned, the Gimbal SDK creates a default Notification. The developer creates and manages a channel and specifies its use in the default Notification via setNotificationChannelId(). Else if the developer does not specify a channel, the Gimbal SDK will create and manage its own channel. No changes are necessary for notifications to post to the user in this mode. © 2014, 2015, 2016, 2017 Gimbal, Inc. All rights reserved. Gimbal is a trademark of Gimbal, Inc.,registered in the United States and other countries. QUALCOMM is a trademark of QUALCOMM Incorporated, registered in the United States and other countries. Use of the iBeacon logo means that a Licensed Product has been designed and certified by the manufacturer to meet Apple performance standards. Apple is not responsible for the operation of this device or its compliance with safety and regulatory standards. Please note that the use of this product with iPod, iPhone, or iPad may affect wireless performance. iPad, iPhone, iPod, and iPod touch are trademarks of Apple Inc., registered in the U.S. and other countries. iBeacon is a trademark of Apple Inc.